There are some great deals on Cyber Monday all over the internet, but Amazon are offering an Xbox One 1 TB bundle that includes three games that trumps all others. 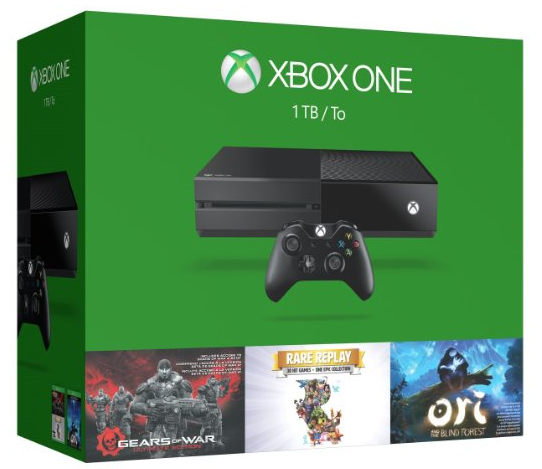 For $349 instead of $399.99 ($50.99 off, 13% discount), you get the Xbox One 1 TB with one controller and three games: Gears of War: Ultimate Edition (full game physical discs), Rare Replay (full game physical discs) and a digital download of Ori and the Blind Forest. There’s also a 3.5mm headset jack so you can plug in any headset and a 14-day trial of Xbox Live Gold. The GOW includes access to the entire Xbox 360 Gears of War collection to play on Xbox One at no additional cost if you play Gears of War: Ultimate Edition on Xbox Live before 12/31/2015 and early access to the Gears of War 4 Beta. With the Backwards Compatibility trait, you can play quite a lot of Xbox 360 games if you already own them on a much better and powerful console. Obviously there are other awesome deals going on right now during Cyber Monday, including a similar deal for the Xbox One (500 GB) that includes the Gears of War: Ultimate Edition and also Target offering the same product, only with a $60 free gift card. For more Xbox One news and deals, check out some of our other posts, like this rumor about Red Dead Redemption 2 and whether the original game will be eventually made compatible with the Xbox One.